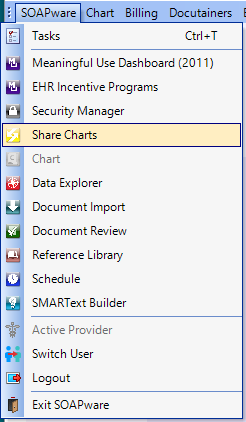 To export a chart to PDF or CCDA, open the Share Charts workspace. Click SOAPware > Share Charts. The Share Charts workspace has three main areas. 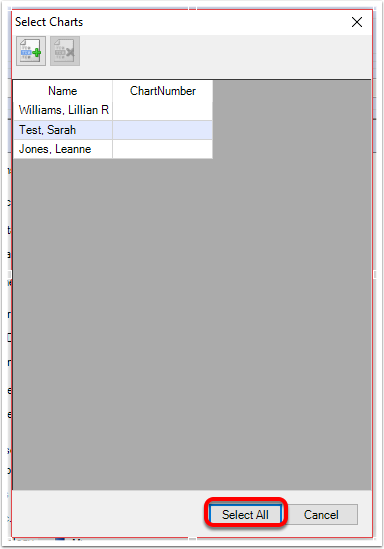 At the top of the screen is the Chart Selection section, where the charts to export/copy are defined; In the middle is the Data Selection section to select the chart sections to be exported; and at the bottom is the Progress section to define the location where the copies of the records (i.e.exported data or copy of the chart) will be placed. It also displays the progress of the export once it begins. Active Provider: Using the drop-down menu, select a specific provider or All Providers. 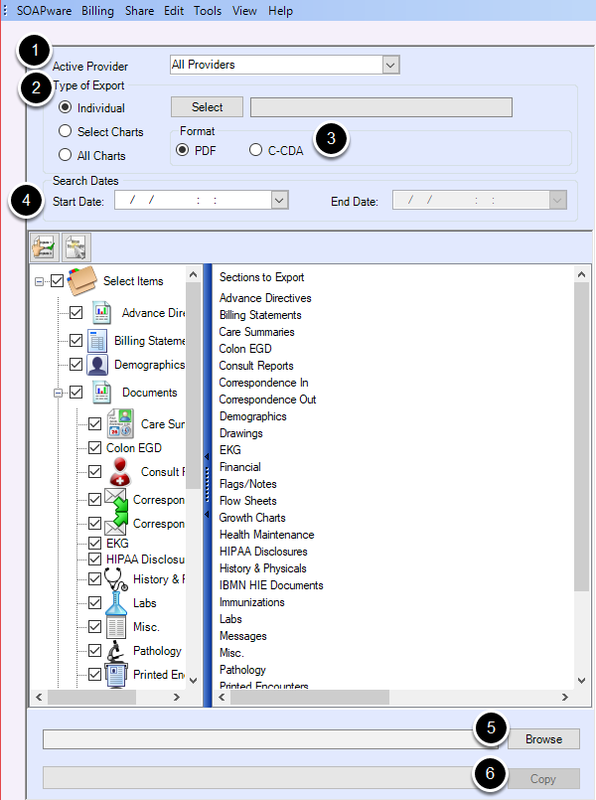 Type of Export: Select Individual to export a single patient's chart. Click Select Charts to select multiple specific charts to export in a batch. Select All Charts to export all patient charts. Format: Select to export patient records to one of the following options: (1) PDF (will include all documents in the record, including images/scans) or (2) CCDA (includes data that complies with the standard set by ONC/CMS, but does not contain the whole chart, such as free text or scans/images that are in the chart.). Start/End Date: Select the Start/End Date for the export. If you wish to export the entire patient chart, leave the Start/End Date blank. Chart Sections: Select the sections of the patients chart that you wish to export (if you wish to export the entire chart, leave all sections checked). Browse: Click the Browse button to select the location to save the file(s). Copy: Click the Copy button to begin exporting the file(s). 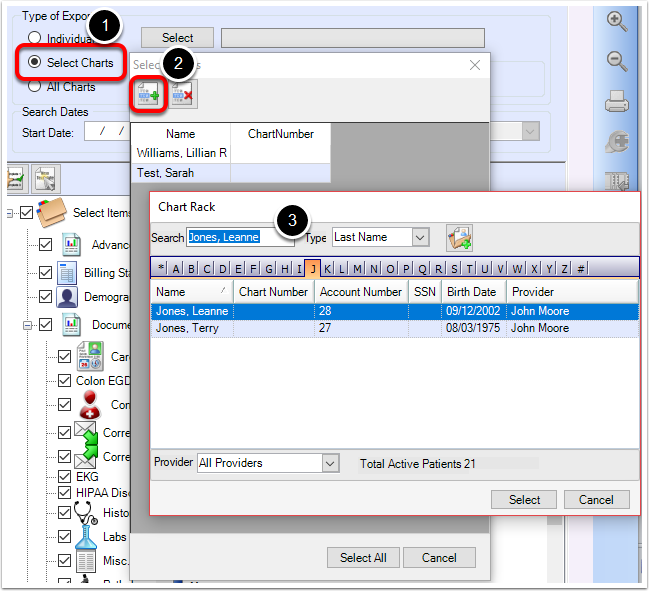 To export a single chart, select Individual, then click the Select button to choose the patient from the Chart Rack. To export multiple charts in a batch, choose Select Charts, then follow the steps detailed below. To export all charts, select All charts. CCDA (includes data that complies with the standard set by ONC/CMS, but does not contain the whole chart, such as free text or scans/images that are in the chart.). To select multiple charts to export, choose the Select Charts under Type of Export. Click the Green + button to add a chart to the export. 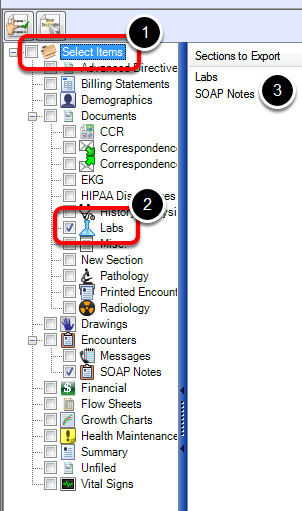 Choose the patient from the chart rack and click Select. Repeat steps 1-3 to add additional charts to the export list. Click Select All to choose the listed charts for export. Exported information can be limited by setting date parameters. Use the Search Dates area to enter a date or a date range, and SOAPware limits the exported information to items created within the specified date parameters. If search dates are not entered then all documents within the chart sections selected will be exported. *Note: Search Dates do not apply for CCDA format. If CCDA is selected, all data will be included on the CCDA document as defined by the document specifications. On the left is a list of chart sections similar to what is displayed in Chart Navigator. On the right, SOAPware lists the chart sections selected to include in the export. By default, all chart sections are selected, which will export the entire chart. Click the "Select Items" checkbox at the top left. This clears the selection list. Place a checkbox in each individual chart section that you wish to export. The sections you have selected to export will display in the Sections to Export area. Click the Browse button on the far right. This displays the Browse For Folder dialog where the location is selected for the exported copy. In order to create a new location, Click the Make New Folder button. Once the location is selected, Click OK. The last step to share charts is to Click the Copy button. This initiates the export process. After Clicking Copy, settings for the export can't be changed. A green progress bar tracks across the bottom as the export progresses. An export can take seconds to minutes, depending on the size of the file. Additional time is required for an export of multiple charts and is somewhat dependent on individual database contents and hardware limitations. When it is complete, the green bar is completely full. At the selected export location, the user will find one copy (i.e. PDF file) for each chart exported. Each is titled with the patient's name, birth date, and chart number in order to make it easier to find specific exported copies. The user can save export formats if he/she wants to have it available for use in the future. To save a format, click the "Create Format" button underneath the search dates section of the workspace. To use a previously saved format, click the "Insert Format" button. HIPAA Regulations: When a user emails any patient records, it is important to remember that the user's email has to be encrypted to meet HIPAA Regulations.